Gina is Scottish and graduated from the University of Edinburgh in Biomedical Sciences. 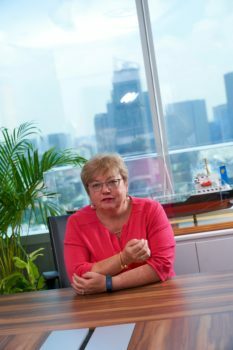 The early part of her working life was with Exxon in both the UK and the international HQ in Belgium, before founding what is now the global petrochemical trading company Integra Petrochemicals Pte Ltd in 1989. Over the years, Gina and her husband have added real estate and construction companies and an Asian based shipping company-with 15 ships to the portfolio. Concerned about food and water availability, has led Gina into shrimp farming and a few soft commodity projects. Gina sits on various boards and councils including, the Brussels based European Petrochemical Association (EPCA) Council for talent, diversity, inclusion and training, the Gulf Petrochemical Association (GPCA) in Dubai and the Singapore Chemical Industry Council (SCIC). Gina was also a founding member of the Woman in Shipping and Trading Association (WISTA), now a global training and advocacy group. She was the president of the board of governors of the German European School in Singapore for several years during which time she headed up a team to design, fund and build a new school campus for 2000 children which will open summer 2018. For her work in the Middle East, Gina was nominated and awarded 2nd place in the most influential woman in oil and gas in the Middle East. Last year, she was included in the Middle East Power 50 for her work in the region over the last decade.